PROBABILITY: These Valentine's Day activities are based on the small candy hearts popular around this holiday. Instead of sayings, these mathematical hearts have letters. Students are trying to accumulate all of the letters in the word VALENTINE or HEART. They first predict how many letters they will have to draw from the bag, then they conduct the experiment, collect and organize data and analyze the class results. 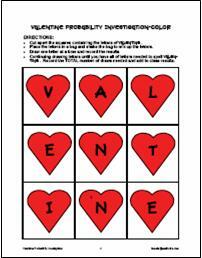 Download Valentine Probability for a straightforward probability handout. Download Valentine Probability Investigation for the hearts and recording sheet to conduct the probability investigation on how many letters students will have to draw (with replacement) to get all of the letters in the word VALENTINE. Download Heart Probability Investigation for the hearts and recording sheet to conduct the simplified probability investigation on how many letters students will have to draw (with replacement) to get all of the letters in the word HEART. DISCRETE MATH: These activities develop students' awareness of discrete math topics: Pascal's Triangle, pathways, and combinations. 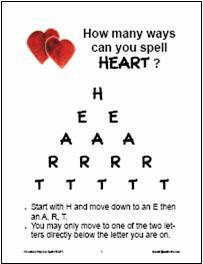 Download How Many Ways Can You Spell HEART ? Teachers should make a transparency of the first page to use in explaining the task. Insert the transparency in a sheet protector so that you can use dry-erase markers and easily erase to show the different paths. Each student needs a copy of the second page. They should show one path in each box until they have found all 16 possible paths. Encourage students to use a systematic process so that they find every possible path. The accompanying answer sheet demonstrates a systematic approach that is effective in solving these types of problems. Valentine's Day Treat challenges students to list all of the possible sundaes that can be made if students choose one ice cream and one topping from the cafeteria list. Note that students must choose a topping for this problem, otherwise they are simply buying ice cream which doesn't count as a sundae. 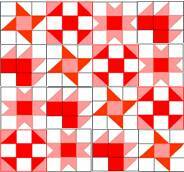 This Valentine Quilt is a great culminating activity for a study of the geometry of quilts. Each student designs a 9-square paper quilt patch using only red, pink and white paper. Students may elect to use a traditional quilt pattern or design their own original pattern and name it. Assemble all of the quilt squares into a class quilt. See Quilt Menu for resources for teaching a mathematical quilting unit. Reinforce the concept of symmetry with this art project which colored paper and symmetrical placement to create symmetric masks. Use red, pink and white paper for Valentine's day or red, white and blue paper for patriotic masks for President's Day. 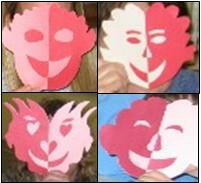 See Symmetric Faces for instructions on creating these masks from 1.5 sheets of construction paper. Students will develop an "eye" for symmetry as they correctly place cut pieces to create a symmetric face. See Symmetric Faces Photo Gallery for ideas to get the creative juices flowing. Note how the color combinations as well as the facial features affect the final product. See more Valentine's Day Math Activities from the Mathwire collection that include suggestions for math activities that use the small candy valentine hearts to practice graphing, fractions, counting and patterns. Students might also use the candy to play the Grab the Candy!game. The collection includes more problem solving and discrete math activities as well as a suggestion to make Valentine Symmetric Faces to study symmetry. Visit the Mathematical Quilts Menu to see all quilting activities. New to Mathwire.com? There are several ways to search the site for activities by Math Standard, Math Topic, or using an alphabetical (A-Z List) search.